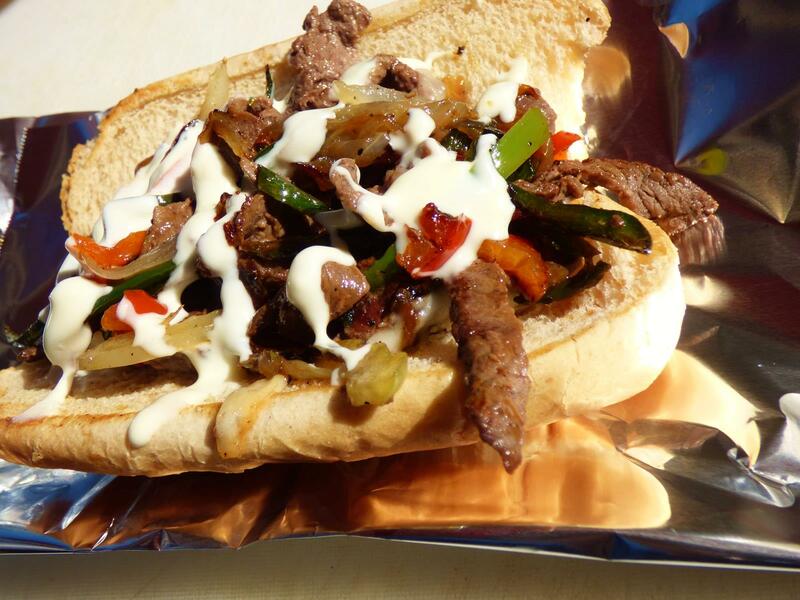 Cheesesteaks hot off the grill and drizzled with queso- perfect Super Bowl Food! Super Bowl recipes and parties call for decadent hand held foods. Foods that guys love (i.e. do not serve mini veggie quiche at your party). Foods we have memories of enjoying at the stadium. Food that require extra napkins. So this year instead of (or alongside) chicken wings, 7 layer dip, and chili treat your friends to a classic cheesesteak souped up for Super Bowl Sunday. What exactly makes this evo grill recipe for cheesesteaks Super Bowl worthy? Two cheeses, 4 peppers, and sweet caramelized onions all on top of hand sliced grass fed beef. Its great for entertaining because all the prep can be done the night before and the entire cook time of the sandwich is less than 5 minutes (once onions and peppers are going). Perfect half time football fare. That makes for both a relaxed host and happy guests. 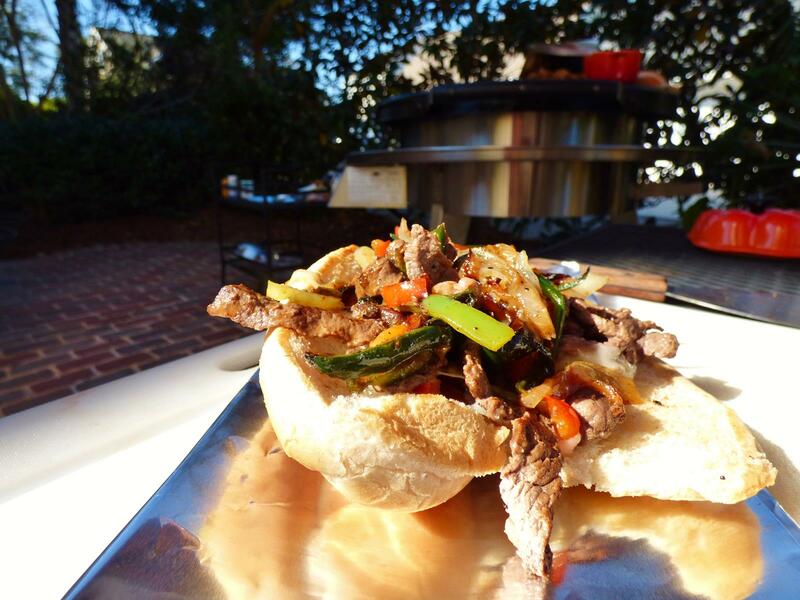 Here’s my Evo Grill recipe for Super Bowl Cheesesteaks! 3-5 lbs strip loin, trimmed ( rib eye, skirt and bottom round also make good choices) I like grass fed. Sliced Mushrooms, optional can be any variety. Meatier varieties like portabellas and shitakes are amazing for creating a vegetarian cheesesteak. NOTE: Recipe can also be made with thinly sliced chicken breast substituting for beef with delicious results – but most guys would rather didn’t. 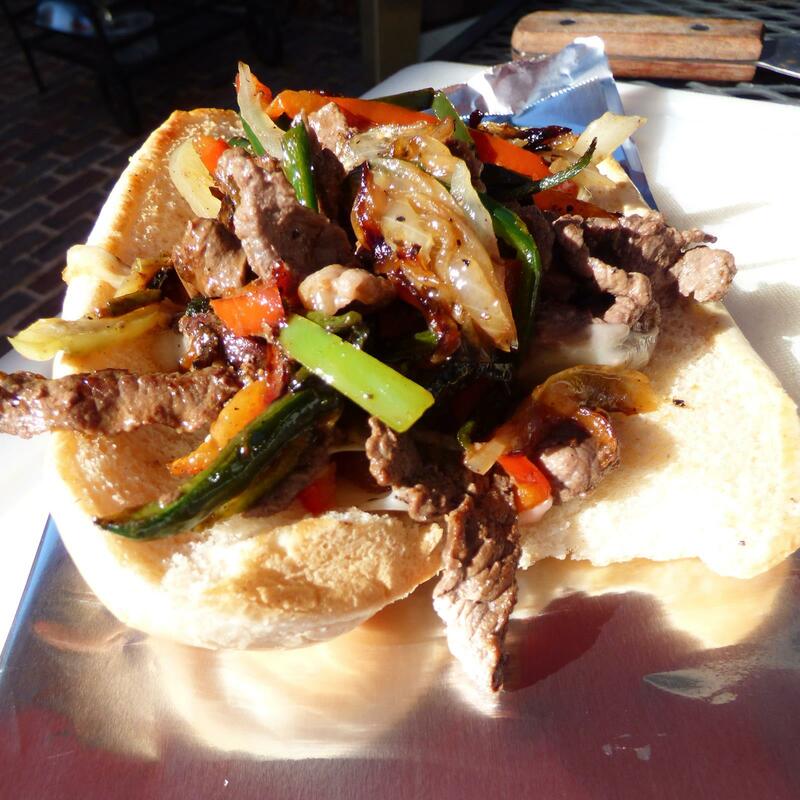 So here’s the trick to making great cheesesteaks, it’s all about how you slice the meat. Although you can use a variety of cuts of beef ( I encourage you to shop the sale and ask the butcher) you must slice it as thinly as possible. This allows the meat to caramelize and cook quickly as well as tenderizing it. I like to go with a cheaper cut with big flavor for this reason. In order to slice the meat thin enough, you will need to put it in freezer for about 30-45 minutes until it is semi frozen. Then with your best knife, slice it on an angle as thinly as you can mange. This is the most time consuming part of the recipe. I did mine the night before and added the seasoning and oil then stored it the frig in a large ziplock bag for next day. I also sliced all my onions and peppers and oiled and seasoned them before placing them into their own bags. Doing this prep ahead allows you to enjoy your own party. Meat sliced and seasoned in advance is ready for grilling. 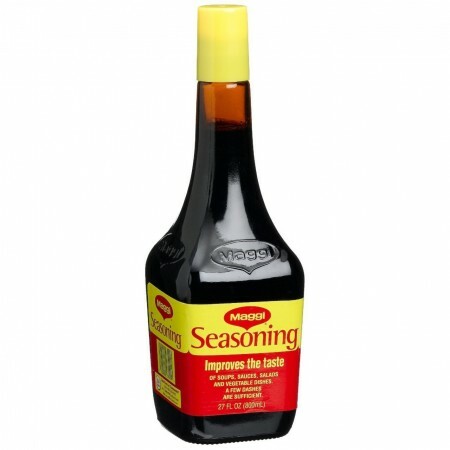 This is a great kitchen staple for seasoning meats, stews, and stir fries. 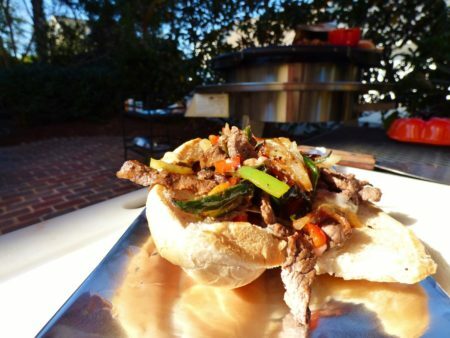 We love cooking this Evo grill recipe for Super Bowl Cheesesteaks because everything is done on one surface in very little time. Everyone can enjoy eating at the same time. Even the cook, which is let’s face it probably you if you’re reading this right now. 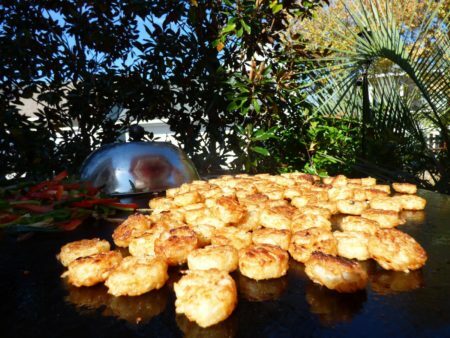 It is sincerely one of my favorite things about entertaining with and owning an Evo Procart. Quick results for large crowds with no dishes afterwards. If you are lucky enough to be watching the big game on an outdoor TV – than even better. But if you don’t have an evo you can also make this inside on a griddle or large cast iron pan over high heat in batches. I’d recommend using another pan alongside for frying up the onions and peppers. Either way, your guests will be drooling inside or out by the time your onions and peppers are ready. There is little in the world that smells better than onions and peppers cooking. That aroma definitely creates a “game day atmosphere”! Onions will take the longest to cook so about 30 minutes before you want to eat go ahead and put those on. Can you spot my pat of butter melting inside? 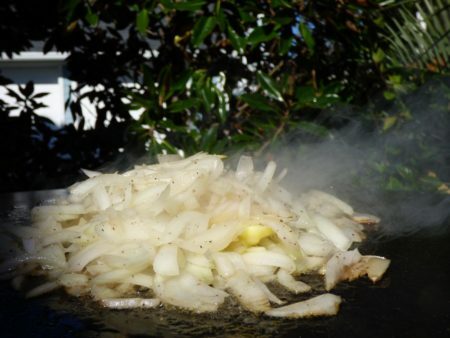 Put your onions on the grill set on high and cook for a couple of minutes. Turn center of grill down, put pat of butter inside pile, and cover with lid to caramelize. Lift lid to stir occasionally. This will take about 30-40 minutes. When onions have begun browning go ahead and put mixed peppers onto grill. They take about 10 minutes.The kind you choose depends on how much heat and color your looking for. This is Super Bowl so do go beyond your standard green! I like to serve round tots from the freezer with my cheesesteaks. So I go ahead and throw them on to brown while onions are cooking. When you are ready to serve put all your extra ingredients on outer ring of evo or on back of the griddle. I use a Le Creuset ramekin to heat and hold the queso for drizzling on steaks and sandwiches by guests. This part will only take about 5 minutes so have your plates and extras at the ready. If you want to toast the rolls you can also do that around edge. It is important to use a soft hoagie roll. 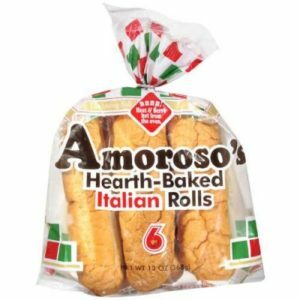 Amoroso rolls are classic and available at most Wal-Marts. 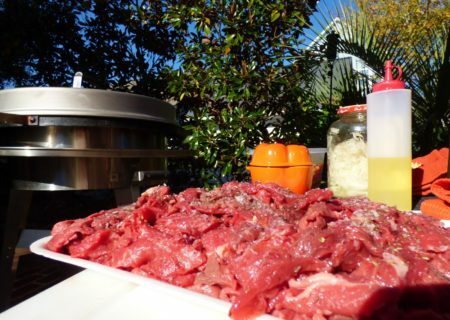 Everything is ready and waiting for the beef to be cooked. Once finished the guests can customize their to their liking. 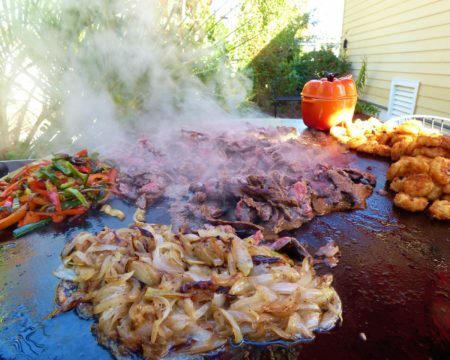 Once the beef (or chicken) is on the grill it only takes about one minute on each side to sear off the beef perfectly. High heat, small pieces, and no crowding is crucial. Turn off evo grill ( or burner) and divide meat into sandwich sized piles. Top each with desired toppings (like onions and peppers )and a slice of cheese. Place roll over pile to melt cheese then pick up whole thing with a piece of folded heavy duty aluminium foil with splatula underneath assisting the lift. 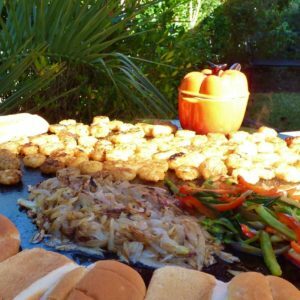 I like to serve from the grill and let guests help themselves to tots and a drizzle hot queso. Most go for it over the totos and sandwiches both. I like to add some jalapenos to my tots then drizzle. It’s a party after all. Tableside I put out chipotle mayo, jalapenos, and ketchup (for the tots) and lots of napkins. The foil helps out with containing the mess but even so… napkins will be needed. Variations:I t is very easy to make a delicious Vegetarian Philly Cheesesteak version of this using mushrooms in place of the beef. I would just finish those veggie sandwiches first then cook the meat to avoid cross over if making both. Extra mushrooms can be offered as a topping to other guests. Chicken can be cooked alongside beef if you want to offer both options. So please comment below to let me know how your Super Bowl party went, what you like to make for game day, and any questions you might have about entertaining on an EVO grill. Enjoy! I am so hungry now! I can’t wait to try this! Right down to the Round Tots! Hope you share some pictures with us when you make it Merrill. And yes, don’t skimp out on the tots- they are so good browned up on the evo. Enjoy!